Today, I photographed the eclipse of the sun in my area. It was covered at 85 percent. Photographing it through a filter, the sun appeared orange. The sun? God made it. The moon? God made it. He allows us to gaze upon His cosmic gallery from this most blessed creation we call home. I saw Him sitting on a plant in our front flower garden area. A leaf hopper perched out in the open, fully camouflaged. His wings were like green leaves, even with dead and brown looking edges and spots. With legs that mimicked tiny branches, he was well disguised. I marvel at creatures like this. There might be those that say that his kind evolved in such a way as to look at their surroundings and match them in their appearance in order to evade would-be attackers. For me, I can only conclude that God, the Creator, made this magnificent insect to look like the environment around him for protection. Strolling slowly on the boardwalk, I noticed several dragonflies darting around near the water’s surface. Dragonflies are so delicate, so quick and so ornate. Everything that God has made is beautiful. Every creature that exists is a masterpiece of God. Stretching his wings toward the south? Today, I looked out my back window and saw a red shouldered hawk in the misty rain. Taking my camera out into the back yard, I tried to be as inconspicuous as possible as I sought to photograph him. I have come to recognize their call, as it is distinct and loud. Beautifully marked with an array of patterned colors in their feathers, they seem to project a stateliness as they perch. God has made thousands of creatures, both great and small. Each one is to His perfect liking. I watched the hawk fly down to the ground and back up again. The rain was increasing, so I finally left him to welcome the evening without me. God tells the hawks what to do–where they should fly, how to build a nest. It’s not by my understanding. There are times when I don’t understand how God is working in my life or the lives of others, but I know that His ways are not my ways. The day and the night are Yours. You set the moon and the sun in their places. He knows all about us and what is happening in our lives. That seems too difficult for us to imagine, yet He is holding all the stars in the universe in place, He is keeping all the cells in our bodies alive, and He has formed and created each individual thing on earth. A magnificent flower, blooming in mathematical perfection draws itself upward to the sun as the earth follows a path around it prescribed by God Himself. Whatever the Lord pleases, He does, in heaven and on earth, in the seas and all deeps. What is the picture of below? A microscopic view of bacteria? Just by looking, it’s hard to tell. So many things in this world have similar shapes and contours. God created all that we know in a way that pleased Him. 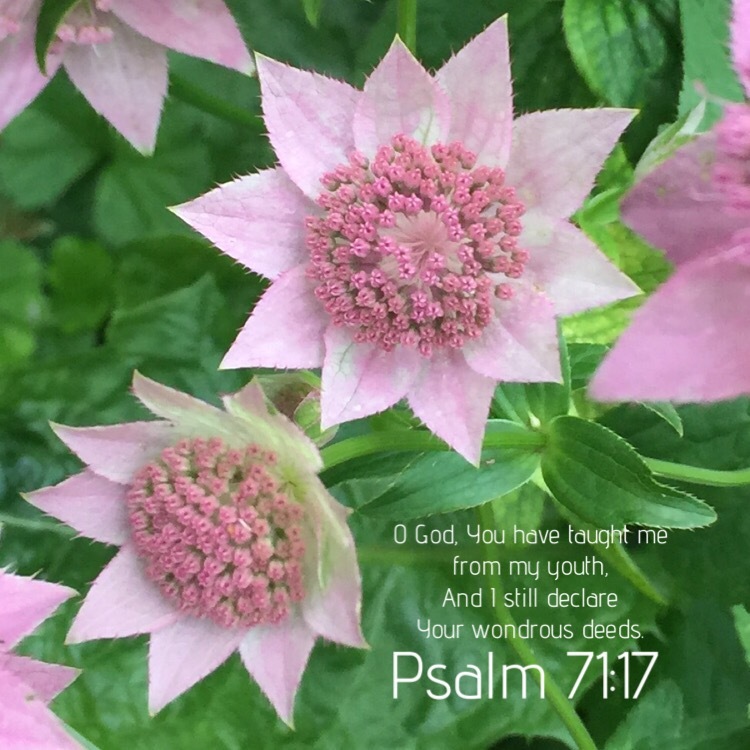 In addition, He created all that we do not know in a way that pleased Him. What we see is only a small portion of God’s great creation. Our generation has been blessed with seeing so much of it. It wasn’t that long ago when no one had EVER seen what the earth looked like from space. Now, with a simple application on a smart phone, even a young child can look at any spot on earth as viewed from space. So, what is the picture of? A sea creature in an aquarium. God’s works are truly to be marveled at. Every creature God has made has its own beauty. Every animal that walks the earth. Then God said, “Let the earth produce every sort of animal, each producing offspring of the same kind–livestock, small animals that scurry along the ground, and wild animals.” And that is what happened. When I look at an animal’s face, I see the face of a living being that God made. 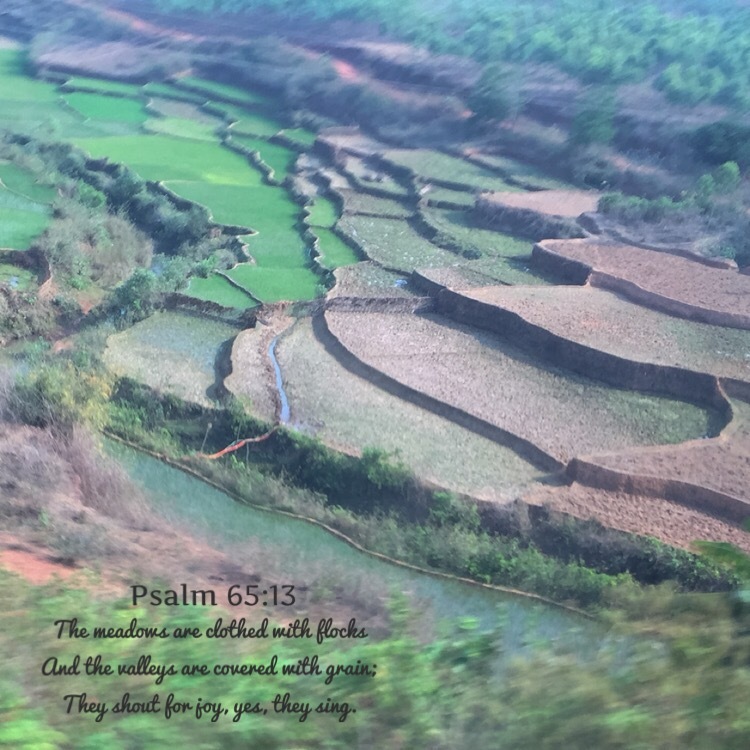 This morning as my husband and I were driving on a rural area of highway, I began thinking about how God places people in the lives of others. I shared a few of my thoughts with him. God is holding everything together–all life, all the universe. Yet, I truly feel that He knows about us individually in a complete way. I believe that He orchestrates things to happen, people to meet and opportunities to be in community with each other. As for my understanding, things don’t just “happen” to us. God is very personal to us, and at the same time, He has a sovereign plan for all of His creation. In the book of Job, God asks many questions that lead to the answer that He is in control. We are not in control, but we can be in fellowship with the One who is. Give thanks to Him who made the heavenly lights–His faithful love endures forever. Having a heart full of praise. Having a heart full of devotion. To know of God’s love deeply within your soul. I photographed the most magnificent bird today. The mix of colors displayed in his sleek feathers was captivating. God has made such beauty in our world! 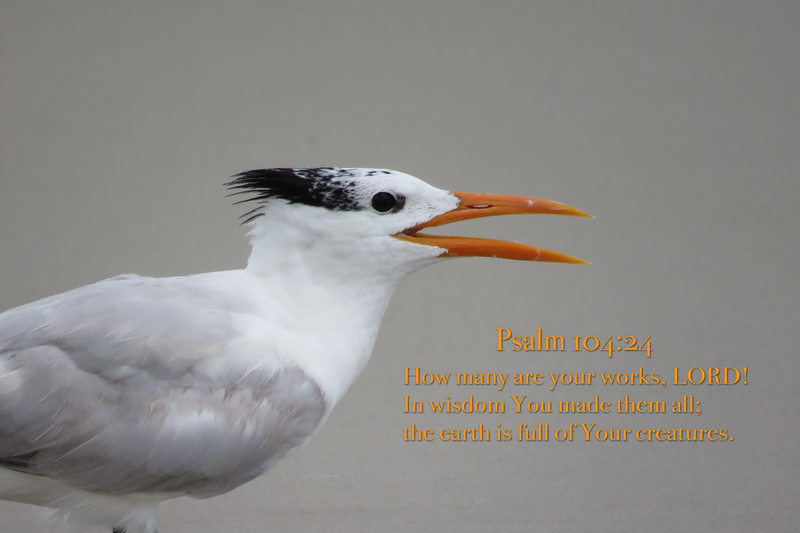 How many are Your works, LORD! In wisdom You made them all; the earth is full of Your creatures. Several weeks ago, I visited an aquarium area with many types of sea creatures on display. Finding almost everything I looked at to be fascinating, I took several pictures. One creature, in particular, was so incredible! It was the Leafy Sea Dragon, a marine fish that looks like a floating plant. It looks so much like the vegetation around it, becoming camouflaged in the midst. For me, I can see God’s work in this. A beautiful fish swimming around looking amazingly like the surrounding plants. I don’t believe that it just “developed on its own” a likeness to its surroundings. Gazing at this marvelous creature only increases my faith in God’s perfect creation of all things. So God created great sea creatures and every living thing that scurries and swarms in the water, and every sort of bird–each producing offspring of the same kind. And God saw that it was good. As I walked over the wooden bridge, I paused to watch a small turtle surfacing in the water below me. With his little neck stretched up into the air, he was sustaining his life as he took a breath. It pleased God to make turtles, as it pleased Him to make all His creatures. He designed this particular type to have the need to come up for air every now and then. Air gives us life, as well. If we cease to breathe, we cease to live. Yet, if we did not have God’s breath in us, we would never have existed. It is God who gives and sustains our lives. When I saw the bird with it’s long flowing head feathers, I immediately began to photograph him. Ruby colored eyes and a long, sleek beak. He was tall, with black feathers closely hugging his neck. When I look at creatures God has made, I marvel at His works and I am blessed by the privilege of seeing them. I was thinking today about people. So often, we look at ourselves in a negative way. We don’t feel as if we are worth much. We think of ourselves as unattractive and unimportant. What if—just for consideration—birds were the most intelligent beings on the planet with minds like people and all people had the minds of birds? Just think of how the birds would look at us! We forget that God has made us in a wonderful way. We have fingers that do fine motor skills. If another creature had a mind like ours, they would see us as wonderful creations of God. Why don’t we see ourselves that way? or speak to the earth, and it will teach you, or let the fish in the sea inform you. 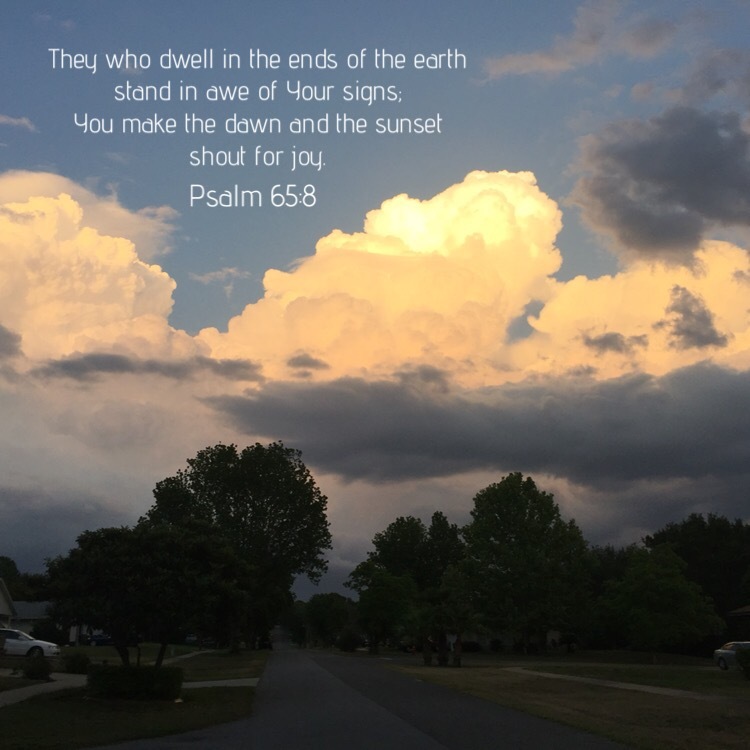 They who dwell in the ends of the earth stand in awe of Your signs; You make the dawn and the sunset shout for joy. There is nothing on earth that was not made by God. From the breath of God ice is made, And the expanse of the waters is frozen. 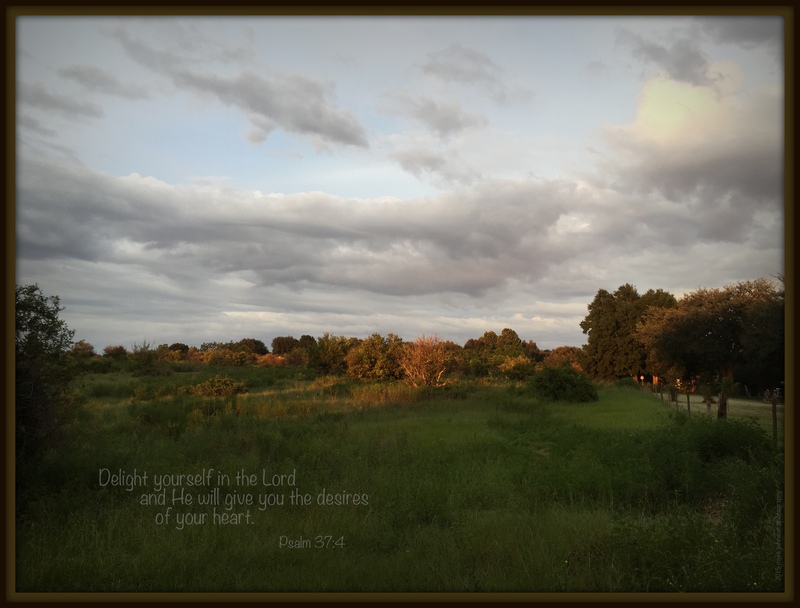 The meadows are clothed with flocks And the valleys are covered with grain; They shout for joy, yes, they sing. As I looked down from the mountain yesterday, I saw the valley below me. The cultivation of grain so artfully planned, the creation of God growing in praise to its Maker. 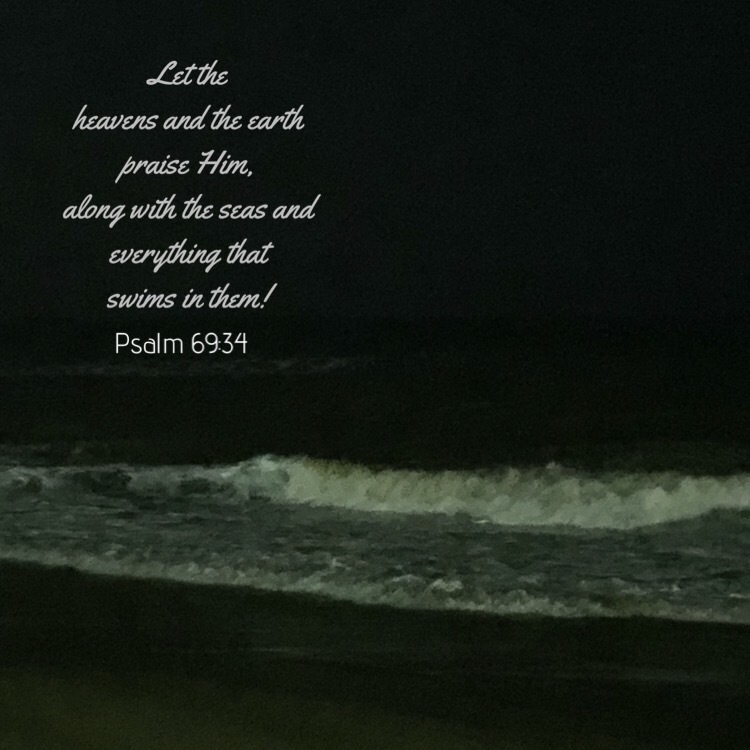 Let the heavens and the earth praise Him, along with the seas and everything that swims in them! I live only an hour and a half drive from the ocean. Tonight, while visiting friends far away from my home, we went to “their” ocean–the one not far from their home. It was evening when we arrived. The moon was high in the night sky and the rolling, white waves crashed on the sand before me. It was a shoreline I had never seen, but it was God’s. Tonight was just the night that He was allowing me to experience another beautiful part of His creation. All praise belongs to God. My friend found the little moth outside my front door when she was visiting a couple of weeks ago. Impressed by its unusually striking appearance, she showed it to me. I’m not sure if either of us had ever seen a moth like that one. After doing some research, I found that we had been looking at a Giant Leopard Moth. This one hadn’t made it to “giant” status yet, but it was still impressive. As my friend held it in her hands, I photographed it. Black and white with a bit of orange on the body, its appearance was quite dramatic. 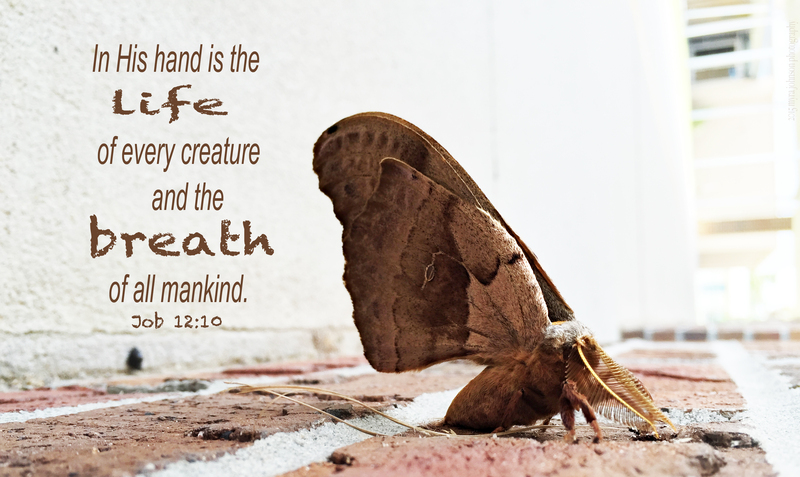 God has made every creature on the earth. Each one is a testimony to His greatness. Walking over to a bush in my yard, I suddenly noticed something on a Lantana bloom. Not really being sure what it was, I cautiously approached an intricately designed, winged creature. Was it a wasp or a bee? Would it decide to sting me at any moment, for being so close? One photograph after another, it remained on the flower, content to be the object of my curiosity. Looking on the internet later to try to find out what it was, I found that I had been watching a Polka-Dot Wasp Moth. Wonderfully arrayed in red, white and blue, this moth was such a beauty to behold. Everything He does reveals His glory and majesty. His righteousness never fails. God fashioned this moth just the way He wanted to. 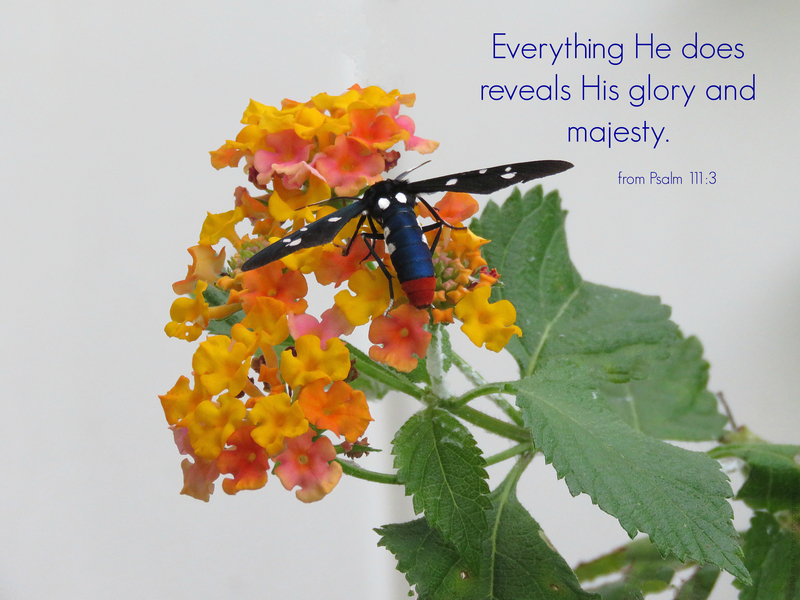 In each color and design on its body, God’s marvelous power of creation was evident. It was quite by accident that I saw it. There was something I had just passed down the highway that I wanted to photograph. While turning into a new housing development area, there was quite a bit of acreage with wild grasses and trees. It was a lovely scene, made even more interesting by its contrasting centerpiece–an abandoned construction machine. This type of equipment is quite costly and very specialized. Why was this one left behind? As it rusts in the harsh sun each day, the moments that it was once in use become more of a remnant of times gone by. It appeared useless and condemned. I suppose that if the right person came along, this big piece of machinery could be restored. Like machinery rusting out in the elements, people need to be restored. Not just some people—all people. The rust and corrosion of sin affects everyone. There is only one remedy. When He died on the cross and rose from the dead, He paid the penalty for our sin. God doesn’t want us to be lost and separated from Him forever. 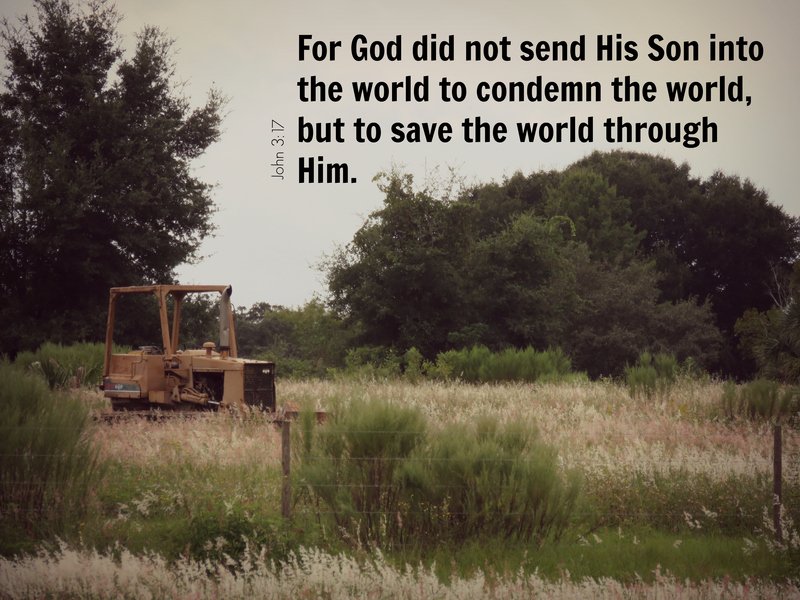 He doesn’t want us to be in a condition of condemnation. Instead, He wants us to be restored—to be made right with Him. To be forgiven, whole and well. I had been photographing an outdoor event that lasted into early evening. It had been raining earlier and the clouds were big and billowy. When my photography work was finished, my husband and I decided to drive to a nearby city to eat dinner. As he was driving, I noticed that the sunset, which was almost completely covered by dark clouds at one point, was spectacular. Rolling down the passenger side window, I tried to photograph the scene behind me. The colors were magnificent and glorious. 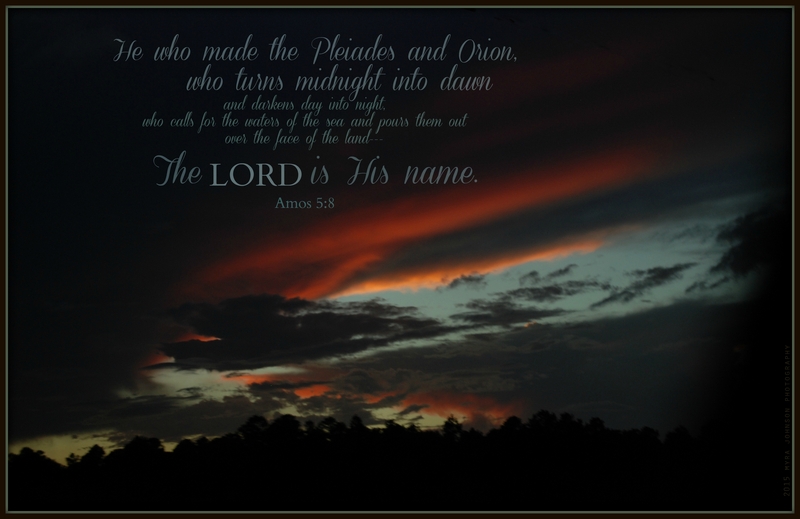 A creation of God, only visible for a few moments…. Without really thinking about, I glanced outside the kitchen window. It had been rainy for the last few hours. Now, in the midst of all the wet grass and glossy tree leaves, golden sunlight was streaming onto my front yard. For me, that was a resounding call to go outside with my camera. After taking some photos of the sunset, I walked around my house, enjoying the coolness of the air and the gentle sounds around me. Stopping at some flowers I had planted earlier in the summer, I found that water droplets were adorning each one like little clear jewels on pink pillows. Everywhere I looked, I saw beauty. A red-shouldered hawk, high in a tree. How blessed I was to see it all! 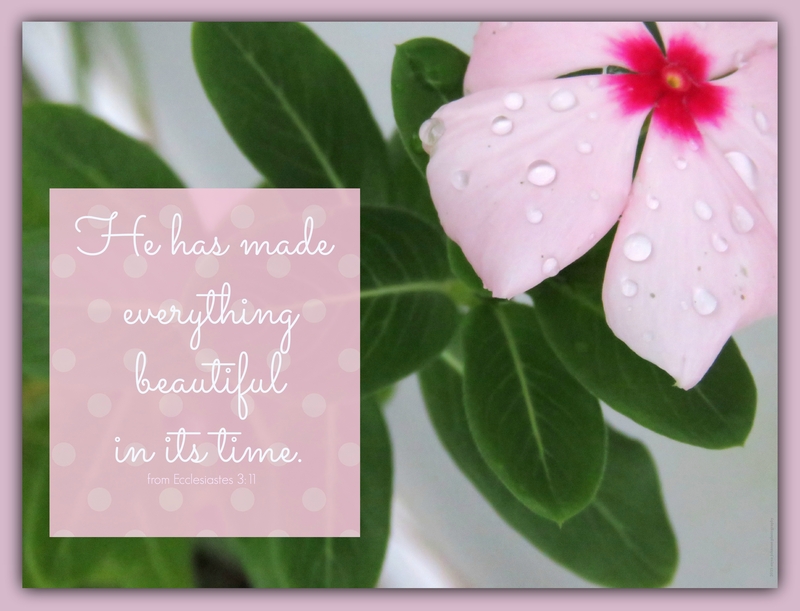 God has made everything beautiful. As I was walking to my office at work today, I found that an intricately beautiful moth was very near my door on the brick. With a closed wing length of probably 3 1/2 inches, he could hardly be missed. Every detail of his appearance was amazing. With wings that looked like a finely crafted rug and feathery antennae perfectly aligned and proportioned, it was truly a marvel to behold. Everything that God has made is wondrous! The sun was setting as I went for a walk in the neighborhood. I consciously thought of enjoying the time, taking in the reality of the moments I was being blessed with. The sunlight was still falling on the trees in the orange grove beside my house, giving them a warm glow as they nestled in the thick green grass that had succumbed to the shadows. Turning around, I noticed the flowering Crepe Myrtle trees in my yard, towering high with bundles of color. A dog barked in the distance. Gopher turtles had dug holes in the ground to shelter themselves in many places I walked. The pink, fluffy clouds to the south looked like a lovely painting. If I had decorated a room especially for someone, I wonder how I would feel if they entered it, but failed to notice or appreciate the decorations? Day after day, God creates unspeakable beauty in our surroundings. He gives it especially to us, to appreciate and enjoy. 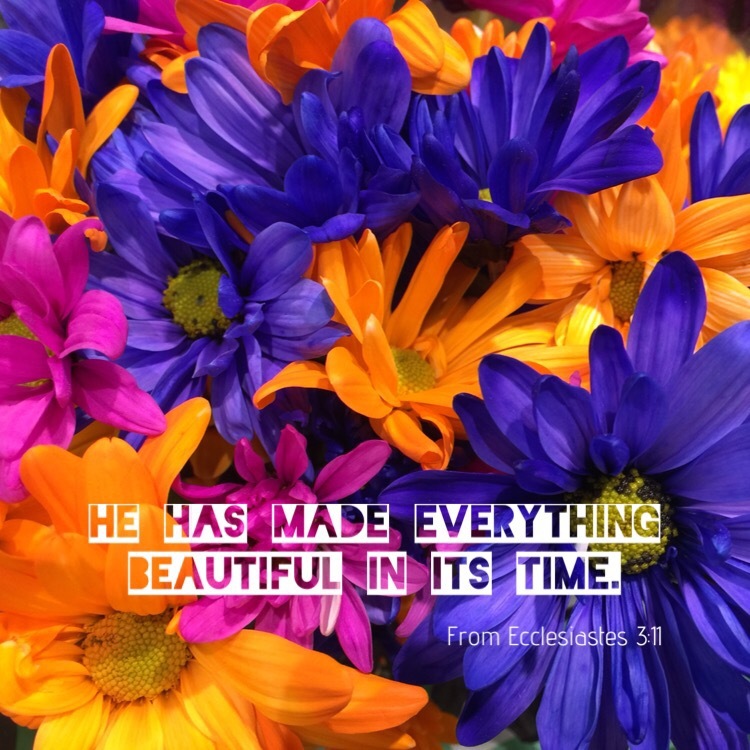 Instead of hurrying through the hours and moments I am given, failing to notice and appreciate the creative works of His hands, I should take the time to enjoy what He has prepared with a thankful and grateful heart. I know people who are terribly frightened by frogs. Not necessarily the poison ones, just regular frogs that hop around harmlessly and make croaking sounds at night. Also, I have personally witnessed people becoming really upset when they see a roach. There are others who are afraid of mice, spiders or snakes. I am only afraid of them if they start coming around me in an aggressive sort of way. I am fine with them sitting on a flower or buzzing by a bush. Even though I am afraid of them, I realize their beauty. Dragonflies don’t bother me at all. That’s a good thing, because there are a great many populating the skies where I live. I think they are beautiful, as well. This statement, in context, is about certain foods that were available and the abstaining of them by some people. 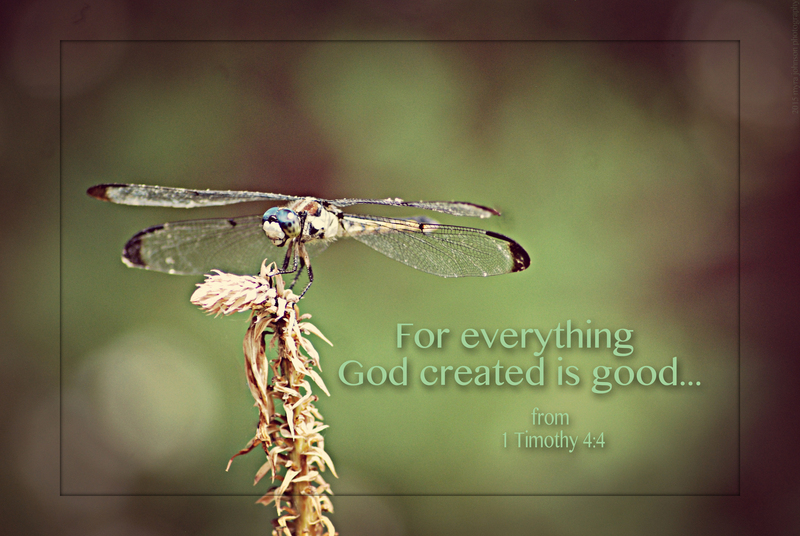 When I think about the first part of the scripture, though, I feel it applies to all God’s creation—everything God created is good. When all things are restored and sin is no more, there will be not be fear of anything God has made. Not even bees, wasps or dragonflies. We will marvel and wonder at the beauty of everything that God has created, knowing that they are good. If you point these things out to the brothers and sisters, you will be a good minister of Christ Jesus, nourished on the truths of the faith and of the good teaching that you have followed.